For other uses, see Tenement (disambiguation). High quality tenements in the Hyndland residential area of Glasgow, built 1898 – 1910. A tenement is a multi-occupancy building of any sort. In Scotland it refers to flats divided horizontally in an established building type, including desirable properties in affluent ares, but in other countries the term often refers to a run-down apartment building or slum building. In parts of England, especially Devon and Cornwall, the word refers to an outshot, or additional projecting part at the back of a terraced house, normally with its own roof. 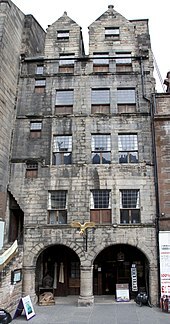 Gladstone's Land is a tenement from 1617 in the Old Town, Edinburgh. Any house, building, or portion thereof, which is rented, leased, let, or hired out to be occupied or is occupied, as the home or residence of more than three families living independently of one another and doing their own cooking upon the premises, or by more than two families upon a floor, so living and cooking and having a common right in the halls, stairways, yards, water-closets, or privies, or some of them. In Scotland, it continues to be the most common word for a multiple-occupancy building, but elsewhere it is used as a pejorative in contrast to apartment building or block of flats. Tenement houses were either adapted or built for the working class as cities industrialized, and came to be contrasted with middle-class apartment houses, which started to become fashionable later in the 19th century. Late-19th-century social reformers in the US were hostile to both tenements (for fostering disease, and immorality in the young) and apartment houses (for fostering "sexual immorality, sloth, and divorce"). As the United States industrialized during the 19th century, immigrants and workers from the countryside were housed in former middle-class houses and other buildings, such as warehouses, which were bought up and divided into small dwellings. Beginning as early as the 1830s in New York City's Lower East Side or possibly the 1820s on Mott Street, three- and four-story buildings were converted into "railroad flats," so called because the rooms were linked together like the cars of a train, with windowless internal rooms. The adapted buildings were also known as "rookeries," and these were a particular concern, as they were prone to collapse and fire. Mulberry Bend and Five Points were the sites of notorious rookeries that the city worked for decades to clear. In both rookeries and purpose-built tenements, communal water taps and water closets (either privies or "school sinks," which opened into a vault that often became clogged) were squeezed into the small open spaces between buildings. In parts of the Lower East Side, buildings were older and had courtyards, generally occupied by machine shops, stables, and other businesses. Such tenements were particularly prevalent in New York, where in 1865 a report stated that 500,000 people lived in unhealthy tenements, whereas in Boston in 1845, less than a quarter of workers were housed in tenements. One reason New York had so many tenements was the large numbers of immigrants; another was that the grid plan on which streets were laid out, and the economic practice of building on individual 25- by 100-foot lots, combined to produce high land coverage. Prior to 1867, tenements often covered more than 90 percent of the lot, were five or six stories high, and had 18 rooms per floor, of which only two received direct sunlight. Yards were a few feet wide and often filled with privies. Interior rooms were unventilated. 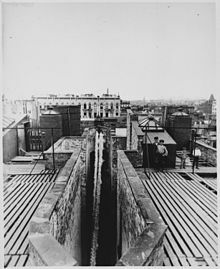 Early in the 19th century, many of the poor were housed in cellars, which became even less sanitary after the Croton Aqueduct brought running water to wealthier New Yorkers: the reduction in well use caused the water table to rise, and the cellar dwellings flooded. Early housing reformers urged the construction of tenements to replace cellars, and beginning in 1859 the number of people living in cellars began to decline. Tenements. Brooklyn, Gold Street, 1890. Brooklyn Museum. A Sweltering Night in New York, 1883. Brooklyn Museum. 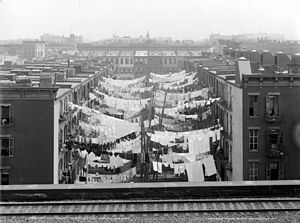 The Tenement House Act of 1867, the state legislature's first comprehensive legislation on housing conditions, prohibited cellar apartments unless the ceiling was 1 foot above street level; required one water closet per 20 residents and the provision of fire escapes; and paid some attention to space between buildings. This was amended by the Tenement House Act of 1879, known as the Old Law, which required lot coverage of no more than 65 percent. 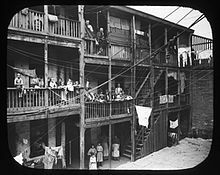 As of 1869, New York State law defined a “tenement house” as “any house or building, or portion thereof, which is rented, leased let or hired out, to be occupied, or is occupied as the home or residence of three families or more living independently of each other, and doing their cooking upon the premises, or by more than two families upon any floor, so living and cooking, but having a right in the halls, stairways, yards, water-closets or privies, or some of them.” L 1867, ch 908. The New York City Board of Health was empowered to enforce these regulations, but it declined to do so. As a compromise, the "Old Law tenement" became the standard: this had a "dumbbell" shape, with air and light shafts on either side in the center (usually fitted to the shafts in the adjacent buildings), and it typically covered 80 percent of the lot. James E. Ware is credited with the design; he had won a contest the previous year held by Plumber and Sanitary Engineer Magazine to find the most practical improved tenement design, in which profitability was the most important factor to the jury. 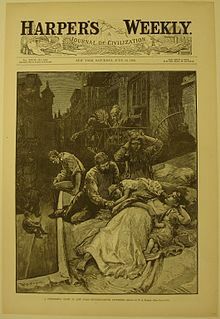 Public concern about New York tenements was stirred by publication in 1890 of Jacob Riis's How the Other Half Lives , and in 1892 by Riis's The Children of the Poor. The New York State Assembly Tenement House Committee report of 1894 surveyed 8,000 buildings with approximately 255,000 residents and found New York to be the most densely populated city in the world, at an average of 143 people per acre, with part of the Lower East Side having 800 residents per acre, denser than Bombay. It used both charts and photographs, the first such official use of photographs. Together with the publication in 1895 by the US Department of Labor of a special report on housing conditions and solutions elsewhere in the world, The Housing of Working People, it ultimately led to the passage of the Tenement House Act of 1901, known as the New Law, which implemented the Tenement House Committee's recommendation of a maximum of 70 percent lot coverage and mandated strict enforcement, specified a minimum of 12 feet for a rear yard and 6 feet for an air and light shaft at the lot line or 12 feet in the middle of the building (all of these being increased for taller buildings), and required running water and water closets in every apartment and a window in every room. There were also fire-safety requirements. These rules are still the basis of New York City law on low-rise buildings, and they have made single-lot development uneconomical. Most of the purpose-built tenements in New York were not slums, although they were not pleasant to be inside, especially in hot weather, so people congregated outside, made heavy use of the fire escapes, and slept in summer on fire escapes, roofs, and sidewalks. The Lower East Side Tenement Museum, a five-story brick former tenement building in Manhattan that is a National Historic Site, is a museum devoted to tenements in the Lower East Side. 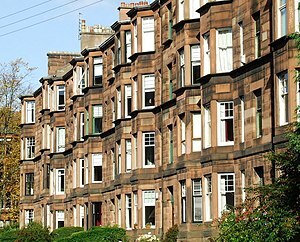 Tenements make up a large percentage of the housing stock of Edinburgh and Glasgow in Scotland. Glasgow tenements were built to provide high-density housing for the large number of people immigrating to the city in the 19th and early 20th century as a result of the Industrial Revolution, when the city's population boomed to more than 1 million people. Edinburgh's tenements are much older, dating from the 17th century onwards, and some were up to 15 storeys high when first built, which made them among the tallest houses in the world at that time. Glasgow tenements were generally built no taller than the width of the street on which they were located; therefore, most are about 3–5 storeys high. Virtually all Glasgow tenements were constructed using red or blonde sandstone, which has become distinctive. In Edinburgh, residential dwellings in the UNESCO World Heritage Sites of the medieval Old Town and Georgian New Town (as well as the Victorian city centre districts immediately surrounding them) are almost exclusively tenements. The Tenement House historic house museum in the Garnethill area of Glasgow preserves the interior, fittings and equipment of an ordinary middle-class tenement from the late 19th century. A large number of the tenements in Glasgow were demolished in the 1960s and 1970s because of slum conditions, overcrowding and poor maintenance of the buildings. Perhaps the most striking case of this is seen in the Gorbals district, where virtually all the tenements were demolished to make way for tower blocks, which in turn have been demolished and replaced with newer structures. The Gorbals is a relatively small area and at one time had an estimated 90,000 people living in its tenements, leading to very poor living conditions; now the population is roughly 10,000. Tenement demolition was to a significantly lesser extent in Edinburgh, thus making its later World Heritage designations in 1985 possible. Largely, such clearances were limited to pre-Victorian buildings outwith the New Town area and were precipitated by the so-called "Penny Tenement" incident. Apartments in tenement buildings in both cities are now highly sought after, due to their locations and often large rooms, high ceilings, ornamentation and period features. 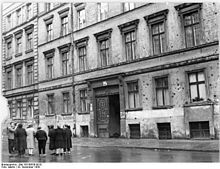 In German, the term corresponding to tenement is Mietskaserne, "rental barracks", and the city especially known for them is Berlin. In 1930, Werner Hegemann's polemic Das steinerne Berlin (Stony Berlin) referred to the city in its subtitle as "the largest tenement city in the world." They were built during a period of great increases in population between 1860 and 1914, particularly after German unification in 1871, in a broad ring enclosing the old city center, sometimes called the Wilhelmian or Wilhelmine Ring. The buildings are almost always 5 stories high because of the mandated maximum height. The blocks are large because the streets were required to be able to handle heavy traffic, and the lots are therefore also large: required to have courtyards large enough for a fire truck to turn around, the buildings have front, rear, and cross buildings enclosing several courtyards. 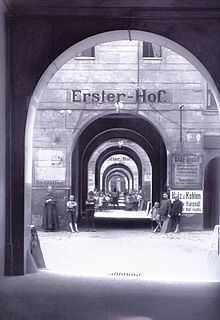 Buildings within the courtyards were the location of much of Berlin's industry until the 1920s, and noise and other nuisances affected the apartments, only the best of which had windows facing the street. One notorious Berlin Mietskaserne was Meyers Hof [de] in Gesundbrunnen, which at times housed 2,000 people and required its own police officer to keep order. Between 1901 and 1920, a Berlin clinic investigated and documented in photographs the living conditions of its patients, revealing that many lived in damp basements and garrets, spaces under stairs, and apartments where the windows were blocked by courtyard businesses. Many apartments in the Wilhelmian Ring were very small, only one room and a kitchen. Also, apartments were laid out with their rooms reached via a common internal corridor, which even the Berlin Architects' Association recognized was unhealthy and detrimental to family life. Sanitation was inadequate: in a survey of one area in 1962, only 15 percent of apartments had both a toilet and a bath or shower; 19 percent had only a toilet, and 66 percent shared staircase toilets. Heating was provided by stoves burning charcoal briquettes. 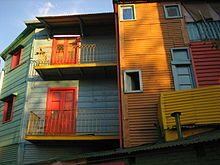 In Buenos Aires the tenements, called conventillos, developed from subdividing one- or two-story houses built around courtyards for well-off families. These were long and narrow, three to six times as long as they were wide, and the size of the patios was reduced until as many as 350 people could be living on a lot that had originally housed 25. Purpose-built tenements copied their form. By 1907 there were some 2,500 conventillos, with 150,000 occupants. El conventillo de la Paloma was particularly famous and is the title of a play by Alberto Vaccarezza. "Chawls" are found in India. They are typically four to five story buildings with 10 to 20 kholis (tenements) on each floor, kholis literally meaning 'rooms'. Many chawl buildings can be found in Mumbai, where chawls were constructed by the thousands to house people migrating to the large city because of its booming cotton mills and overall strong economy. 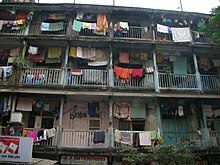 A typical chawl tenement consists of one all-purpose room, which functions both as a living and sleeping space, and a kitchen which also serves as a dining room. A frequent practice is for the kitchen to also serve as a bedroom for a newly married couple in order to give them some degree of privacy. Kamienica (plural kamienice) is a Polish term describing a type of residential tenement building made of brick or stone, with at least two floors. There are two basic types: one designed as a single-family residence, which existed until ca. 1800 (a burgher house), and the other designed as multi-family housing, which emerged in the 19th century and was the basic type of housing in cities. From the architectural point of view, the word is usually used to describe a building that abuts other similar buildings forming the street frontage, in the manner of a terraced house. The ground floor often consists of shops and other businesses, while the upper floors are apartments. Kamienice have windows in the front, but not in the side walls, since the buildings are close together. The first type of kamienica is most prevalent especially in centres of historical cities such as Kraków, Poznań, Wrocław, and Toruń, whereas the second type is most prominent in Łódź. 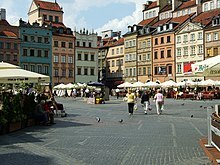 The name derives from the Polish word kamień (stone) and dates from the 15th century. ^ Mauch, Jason (14 May 2018). Industrialism. Infobase Publishing. Archived from the original on 14 May 2018 – via Google Books. ^ Shorter Oxford English Dictionary, 6th ed. Oxford: Oxford University, 2007, ISBN 0199206872, p. 3804. ^ "Gladstone's Land". National Trust for Scotland. 27 November 2017. Retrieved 28 March 2019. a towering testament to tenement life in Edinburgh’s Old Town. It was once owned by merchant Thomas Gladstone, who extended and remodelled the building to create opulently decorated apartments. Gladstone attracted wealthy tenants including William Struther, Minister of St Giles’ Cathedral, and Lord Crichton, as well as the high-end grocer John Riddoch, who traded from the ground floor. ^ Quoted in Plunz, p. 167. ^ For example, Heller, Vivian. The City Beneath Us: Building the New York Subways, New York Transit Museum, New York: Norton, 2004, ISBN 978-0-393-05797-3, p. 34 Archived 2014-12-08 at the Wayback Machine quotes an Italian mason contrasting the better accommodations for the poor built in New York in response to a 1901 law with tenements: "We didn't call them tenements ... we called them apartment houses, because that's what they really were. To us, a tenement was a dump." ^ a b c Bauman, p. 6 Archived 2014-06-27 at the Wayback Machine. ^ Hutchison, Janet. "Shaping Housing and Enhancing Consumption: Hoover's Interwar Housing Policy", From Tenements to the Taylor Homes pp. 81–101, p. 83 Archived 2014-06-27 at the Wayback Machine. ^ Fairbanks, Robert B. "From Better Dwellings to Better Neighborhoods: The Rise and Fall of the First National Housing Movement," From Tenements to the Taylor Homes pp. 21–42, p. 22 Archived 2014-06-27 at the Wayback Machine. ^ a b Plunz, p. 161. ^ a b c Plunz, p. 164. ^ Nadel, Stanley. Little Germany: Ethnicity, Religion, and Class in New York City, 1845-80, Urbana: University of Illinois, 1990, ISBN 0-252-01677-7, p. 34 Archived 2013-05-28 at the Wayback Machine. ^ "Judge Declines to Extend Definition of "Tenement House" by Andrew Fraser, Esq. | MOULINOS & ASSOCIATES". Archived from the original on 2017-09-26. Retrieved 2016-10-07. ^ * Howe, Kathy (January 2004). "National Register of Historic Places Registration: Maple Grove Cemetery". New York State Office of Parks, Recreation and Historic Preservation. Archived from the original on 2012-10-18. Retrieved 2011-01-12. ^ Riis, Jacob A., How the Other Half Lives: Studies among the Tenements of New York. Repr. ed. Sam Bass Warner, Jr., Cambridge, Massachusetts: Belknap/Harvard University, 1970. ^ Chambers, Robert (1824). Notices of the most remarkable fires in Edinburgh, from 1385 to 1824, including an account of the great fire of November, 1824. Edinburgh: Smith. p. 11. OCLC 54265692. ^ "The 'Penny Tenement' collapse that changed Edinburgh forever". scotsman.com. ^ Hegemann, Werner. Das steinerne Berlin: Geschichte der grössten Mietkasernenstadt der Welt, Berlin: Kiepenheuer, 1930. ^ Related to the width of the street, but generally the maximum, 72 feet: Girouard, p. 329. ^ Girouard, pp. 337–38 says that the blocks had been intended to be subdivided with side streets. ^ Elkins, pp. 20, 126, 164–67. ^ Hake, Sabine. Topographies of Class: Modern Architecture and Mass Society in Weimar Berlin, Ann Arbor: University of Michigan, 2008, ISBN 0-472-07038-X, p. 30. ^ Reese, Dagmar. Growing Up Female in Nazi Germany, Ann Arbor: University of Michigan, 2006, ISBN 0-472-09938-8, p. 165 Archived 2018-05-14 at the Wayback Machine. ^ Republished as Hinterhof, Keller und Mansarde: Einblicke in Berliner Wohnungselend 1901–1920, ed. Gesine Asmus, Reinbek bei Hamburg: Rowohlt, 1982, ISBN 3-499-17668-8. ^ a b Elkins, p. 189. ^ Maria Bogdani-Czepita and Zbigniew Zuziak, Managing Historic Cities, Kraków: International Cultural Centre, 1993, ISBN 9788385739074, p. 194 Archived 2018-05-14 at the Wayback Machine. ^ Tomasz Torbus, Poland, Nelles guides, Munich: Nelles, 2001, ISBN 9783886180882. Bauman, John F. "Introduction: The Eternal War on the Slums," From Tenements to the Taylor Homes: In Search of an Urban Housing Policy in Twentieth-Century America, ed. John F. Bauman, Roger Biles, and Kristin M. Szylvian, University Park: Pennsylvania State University, 2000, ISBN 0-271-02012-1, pp. 1–17. Plunz, Richard A. "On the Uses and Abuses of Air: Perfecting the New York Tenement, 1850–1901," Berlin/New York: Like and Unlike: Essays on Architecture and Art from 1870 to the Present, ed. Josef Paul Kleihues and Christina Rathgeber, New York: Rizzoli, 1993, ISBN 0-8478-1657-5, pp. 159–79. Worbs, Dietrich. "The Berlin Mietskaserne and Its Reforms," Berlin/New York, pp. 144–57. Huchzermeyer, Marie. Tenement cities: from 19th century Berlin to 21st century Nairobi, Trenton, New Jersey: Africa World Press, 2011, ISBN 9781592218578. Kearns, Kevin C. Dublin Tenement Life: An Oral History of the Dublin Slums, Dublin: Gill & Macmillan, 1994, repr. 2006, ISBN 9780717140749. Lubove, Roy. The Progressives and the Slums: Tenement House Reform in New York City, 1890–1917, Pittsburgh: University of Pittsburgh Press, 1963, OCLC 233162. Worsdall, Frank. The Tenement: A Way of Life: A Social, Historical and Architectural Study of Housing in Glasgow, Glasgow: W. and R. Chambers, 1979, ISBN 9780550203526. Polland, Annie. "Ivory Towers and Tenements: American Jewish History, Scholars and the Public," American Jewish History 98 (2014) 41-47: how museums interpret the tenements in New York City. Steinberg, Adam. "What we talk about when we talk about food: Using food to teach history at the Tenement Museum," Public Historian 34.2 (2012) 79-89. Look up tenement in Wiktionary, the free dictionary.